Chocolate candy roses make beautiful gifts. You can give a single long stemmed chocolate, or a chocolate rose bouquet. Whatever you decide, you are sure to make a lasting impression. Chocolate candy roses can be purchased from some of the finest chocolate suppliers in the country. Just Flowers offers a lovely Chocolate Roses bouquet. They are beautiful and a gift anyone would treasure. However, if you have the time and inclination, you can create some lovely roses of your own. Here are two ideas for making a chocolate candy rose. Buy a chocolate rose mold. I recommend that you check out the wide selection of molds available at Candyland Crafts and One Stop Candle. Molded chocolates are fairly easy to make. You can choose to use white, milk, or dark chocolate. The secret to making the best chocolate roses is to be sure and temper the chocolate. If you are making small rosebuds, you can place florists wire in the base of your chocolate as it is setting. You will easily be able to wrap it with florist's tape, adding a few artificial leaves as you go. If you want to make larger roses, you should really use lollipop sticks or skewers to support the weight of your flower. If this is your first time making homemade molded chocolates, you can read more details on how to mold chocolate candy. Another idea for making chocolate candy roses is to use chocolate kisses. They are quicker to make because you don't have to prepare the chocolate but can use ready made Hershey's kisses. Confectioners glue is an edible mixture used in some candy making. Confectioner's glue is made by whisking together 2 teaspoons of meringue powder (egg white powder) and 1/8 cup water, and then mixing in 1 1/2 cups of powdered sugar until thick and smooth. 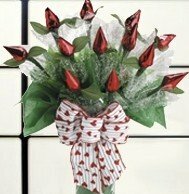 Prepare confectioners glue and then "glue" bottoms of two red kisses together to form each rose. Allow to set. Poke floral wire through the center of a cellophane square and then into one pointed end of each rose. Twist cellophane slightly around wire and kisses and secure with floral tape. Continue wrapping tape down the wire "stem" adding a couple of leaves as you go. If you want to present a complete bouquet, choose a pretty ribbon to secure the roses together. You can even wrap the chocolate bouquet in tissue paper to complete the look.